You receive money from a customer. If the customer refuses to pay you, or goes out of business, you need to write off the amount owing. You then use the Write-Off Bad Debts function. You can also process receipts and payments for customers and suppliers when you process your bank and credit card transactions. These three functions work in an almost identical manner. Once you know how to use one of these functions, you can use the others. If a customer returns items to you, or you return items to a supplier, you do NOT use these functions. Instead, you create a Customer Return or Return Items to a Supplier. This reverses the invoice, adjusts the item quantities on hand and updates the customer/supplier balance. In Customers, Suppliers or Banks and Credit Cards screens, via the links in the Quick Links section. 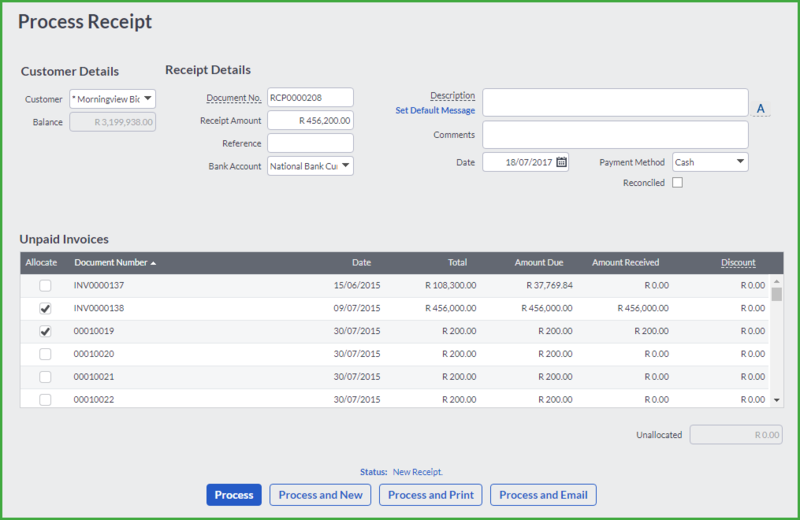 Select the Customer Receipts or Supplier Payments options on the Customers or Suppliers menus. If you are processing a receipt or payment that is not related to a customer or supplier, you can use the Banking option from the Banking menu. When a customer or supplier is set to automatically allocate receipts or payments to the oldest invoices, the system will automatically allocate them in this screen. This includes receipts and/or payments processed via the banking option. Once you have processed a customer receipt or supplier payment, you cannot edit it. If you need to correct a transaction, you will need to reverse the entire transaction by processing another receipt or payment, but with a negative value. For example, if you processed a receipt for 120.00 instead of 1200.00, you will need to process a receipt for -120.00 to correct the entry. Then you will process another receipt for the correct amount. You will use the same process to reverse a receipt if it is returned by your bank. Use the same date and reference number on your transaction to make it easier to reconcile. If you process a receipt or payment which includes a discount, the system does not allow you to edit these transactions.